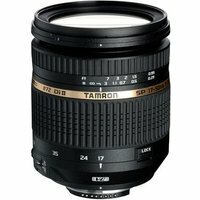 The Tamron SP 17-50mm F/2.8 XR Di II VC lens for cropped sensor digital cameras covers the very popular 17-50mm focal length range (equivalent to 26-78mm in the full-frame 35mm format ) making it extremely versatile. Its wide aperture provides practical advantages in low-light shooting and image control, giving you greater creative control. The 17-50mm f2.8 XR Di II VC lens delivers impressive sharpness and contrast over its entire focal-length and aperture range, and at its maximum aperture of f/2.8 produces beautiful images with a shallow depth of- field and smooth, natural out-of-focus areas (i.e. excellent bokeh). The new lens is equipped with Tamron's Vibration Compensation (VC) stabilization mechanism, which controls the effects of camera shake in three planes. The VC function, in combination with the wide maximum aperture, permits sharp hand-held photography, even when shooting in low-light conditions, giving you greater photographic freedom.